Here is a summary of what we feel a family new to Scouting and Troop 71 should know. Feel free to contact any Troop Committee member or other leader if you have questions. What is the purpose of Boy Scouts? Boy Scouting, one of three membership divisions of the BSA (the others are Cub Scouting and Venturing), is available to boys who have earned the Arrow of Light Award or have completed the fifth grade, or who are 11 through 17 years old, and subscribe to the Scout Oath and Law. The program achieves the BSA's objectives of developing character, citizenship, and personal fitness qualities among youth by focusing on a vigorous program of outdoor activities. In 2007, the Boy Scout program membership totaled 851,572 Boy Scouts in 41,947 troops. What are the aims and methods of the Scouting program? Ideals: The ideals of Boy Scouting are spelled out in the Scout Oath, the Scout Law, the Scout motto, and the Scout slogan. The Boy Scout measures himself against these ideals and continually tries to improve. The goals are high, and, as he reaches for them, he has some control over what and who he becomes. Patrols: The patrol method gives Boy Scouts an experience in group living and participating citizenship. It places responsibility on young shoulders and teaches boys how to accept it. The patrol method allows Scouts to interact in small groups where they can easily relate to each other. These small groups determine troop activities through their elected representatives. Outdoor Programs: Boy Scouting is designed to take place outdoors. It is in the outdoor setting that Scouts share responsibilities and learn to live with one another. It is here that the skills and activities practiced at troop meetings come alive with purpose. Being close to nature helps Boy Scouts gain an appreciation for God's handiwork and humankind's place in it. The outdoors is the laboratory for Boy Scouts to learn ecology and practice conservation of nature's resources. Advancement: Boy Scouting provides a series of surmountable obstacles and steps in rank through the advancement method. The ranks of Scouting are Scout, Tenderfoot, Second Class, First Class, Star, Life and Eagle. The Boy Scout plans his advancement and progresses at his own pace as he meets each challenge. The Boy Scout is rewarded for each achievement, which helps him gain self-confidence. The steps in the advancement system help a Boy Scout grow in self-reliance and in the ability to help others. Personal Growth: As Boy Scouts plan their activities and progress toward their goals, they experience personal growth. The Good Turn concept is a major part of the personal growth method of Boy Scouting. Boys grow as they participate in community service projects and do Good Turns for others. Probably no device is so successful in developing a basis for personal growth as the daily Good Turn. Frequent personal conferences with his Scoutmaster help each Boy Scout to determine his growth toward Scouting's aims. Spiritual Growth: Membership in Troop 71 is open to boys and leaders of all religions. Most religions recognize Scouting as a youth ministry and have created religious emblems programs specific to their faith. These programs encourage spiritual development by providing specific religious instruction and encourage both youths and adults to become more active in their own faith. The religious emblems programs offer awards (patches and medals) that are approved for wear on Boy Scout uniforms. Adult Association: Boys learn from the example set by their adult leaders. Troop leadership may be male or female volunteers. Our Troop encourages all parents to be involved because association with adults of high character is important at this stage of a young man's development. Adult leadership positions include Scoutmaster, Assistant Scoutmasters, Troop Committee Chair, Advancement Chair, Secretary, Treasurer and Quartermaster. What outdoor activities can my son participate in? Summer camp represents the highlight of the year for most Scouts. At Camp Long Lake (about an hour northeast of Brookfield) in Fond du Lac County, scouts learn teamwork within their patrol and troop and seize this opportunity to pass advancement requirements and earn merit badges. Summer camp blends fun programs and advancement, competitive and noncompetitive events, and individual, patrol, and troop activities. Camp gives leaders an opportunity to reinforce what their Scouts have learned throughout the year. The troop also participates in various weekend camps, hikes and bike hikes throughout the year. From time to time Troop 71 offers high-adventure programs that include backpacking, canoeing, mountain biking, horseback riding, whitewater rafting and kayaking, sailing, mountaineering, and much more. As national high-adventure bases for older Scouts, the Florida National High Adventure Sea Base, Northern Tier National High Adventure Program (in northern Minnesota and Canada), and Philmont Scout Ranch (in northern New Mexico) present unique opportunities for many youths year after year. More on these later. Scouts have always taken pride in being good stewards of the outdoors. Leave No Trace guidelines allow them to camp, hike, and take part in outdoor-related activities that are environmentally sound, and teach them to be considerate of other users of the out-of-doors. What community service projects are required? Members of the Boy Scouts of America have always provided service to others. It begins with the Scout slogan "Do a good turn daily" and continues through individual Eagle Scout leadership service projects. Among other community service projects, members of Troop 71 help St. John Vianney annually with the church’s festival. How does my son join? First, of course, is your son's interest and desire to become a Boy Scout. Hopefully, he has visited several Troops in the area, is interested in Scouting, and has decided that Troop 71 offers the program that he is most interested in. The logistics are fairly easy. First, get a New Scout Application Form from the Scoutmaster or Assistant Scoutmaster - Advancement. You also will get a package that contains information on dues, charter fees, medical forms, and other information that helps us administer the Troop and communicate efficiently with you. My son has a disability. Will he be able to join? Yes. The basic premise of Scouting for youth with special needs is that every boy wants to participate fully and be respected like every other member of the Troop. While there are, by necessity, troops composed exclusively of Scouts with disabilities, experience has shown that Scouting usually succeeds best when every boy is part of a patrol in a regular Troop. Scouts with physical or mental disabilities may advance through Scouting’s ranks by meeting advancement guidelines or approved alternatives. A council advancement committee may allow a Scout to complete alternative requirements tailored to his ability. Scouts with permanent mental disabilities may request extended membership beyond age 18. Dues are to be paid directly to the Troop Treasurer and checks made payable to BSA Troop 71. Failure to pay dues by the established date will place the Scout on inactive status, which will eliminate the Scout from consideration for advancement and participation in Troop outings until past due bills are paid. Registration fees for active adult leaders will be paid by the Troop. Scouting is a boy-lead activity. That is probably the biggest difference you will see between Cub Scouts and Boy Scouts. We have a senior Scout leadership composed of the Senior Patrol Leader (SPL) plus at least one Assistant Senior Patrol Leader (ASPL). These Scouts are responsible for planning and running our meetings. Typically, the SPL is responsible for managing the meeting plan for a month, with the support of the ASPLs, the Scoutmaster, the Assistant Scoutmasters, and other supporting adults (by the way, we would really like to get new Scout parents involved in this process - ask us what you can do). The Scout leadership is also supported by the Patrol Leaders. Parents are encouraged, but not required, to stay around for meetings, which are held on most Mondays during the school year. The meetings usually start at 7:30 and end around 8:30. Please make sure you are on time to pick up your sons if you don’t stay for the meeting. • Campout planning (if necessary; it also may be held after the meeting). Three or four times a year we will have a special meeting, called a Court of Honor. During these meetings boys receive special recognition for rank advancements, merit badges and other awards. Parents are expected to attend these meetings, especially if their sons are receiving recognition. Parents are invited to come up to the front of the room to share in the recognition with their sons. These meetings normally run until about 9 p.m. and end with a pizza party. Boys should wear their full uniform, including merit badge sashes and bolo ties. They should not wear jeans or athletic attire to courts of honor. How do the campouts and other outdoor activities work? We typically work out one outdoor activity per month. Sometimes there are more, sometimes less. For each of these events, there will be a Scout coordinator and an Adult coordinator (sometimes parent and son, but not always). We very much would like our new Scout families to get involved in a "backup" role for these events as well. Food: For most campouts, we eat by "Patrol Method." This means the patrols procure and cook food together (Scouts and attending adults). The food expense needs to be paid up front to whoever is buying the food and cannot be refunded if your son doesn’t go on the outing. Your son can pay using his "Scout Account" (more on this later). Typically, cost is $3 per breakfast, $4 per lunch and $5 per dinner. At Camp Long Lake the Troop eats in a dining hall. Adult leaders, the SPL and ASPLs are not required to pay for food. Gear: The Troop has tents, propane, propane stoves, patrol boxes with cooking gear, lanterns, etc. The Troop does not provide sleeping bags and other personal gear. What type of equipment should we get? ■Khaki Scout shirt (we recommend the short-sleeve) - comes with U.S. Flag sewn on. Buy it large enough to last at least a couple of years. If your son is a Webelos Scout, the khaki shirt he may be wearing now can be used until he outgrows it. ■Green Troop numerals "7" and "1" (given to your son when he joins the Troop). ■Green epaulets will be given to your son when he joins the Troop. ■Troop 71 t-shirt (which will be given to your son when he joins the Troop). ■Although it is not required, it would be nice if Scouts bought and wore official Boy Scout hats, belts, pants/shorts and socks. ■A Boy Scout Handbook will be given to your son by the Troop when he joins. (It is a good idea to buy a cover, either plastic or cloth). ■Personal mess kit (although the Scout Shop has BSA mess kits, other types found at sporting goods stores are adequate). ■Troop 71 t-shirts (at least two) for day wear at camp (this is known as a Class B uniform shirt). The Troop sells these in late spring each year. Two are included with your camp fees. What are the funding sources for campouts and other activities? Generally, the Troop subsidizes 50% of the costs associated with any Troop activity, including weekend camping trips. However the Scout is expected to pay for the weeklong summer program at Camp Long Lake. (Adult leaders are not expected to pay for activities.) Troop dues and income from the annual Christmas wreath sales are used to pay for activities and to maintain Troop equipment (stoves, lanterns, tents, etc.). We require the boys to sell at least $350 in wreaths per year. If they do not sell $350 in wreaths they are expected to pay $100 in dues. Each Scout has an individual Scout Account established by the Troop Treasurer where funds may be credited and deducted. This money come from commissions the individual Scout earns for popcorn and wreath sales. The adult application requests background information that should be checked by the unit committee or the chartered organization before accepting an applicant for unit leadership. While no current screening techniques exist that can identify every potential child molester, we can reduce the risk of accepting a child molester by learning all we can about an applicant for a leadership position--his or her experience with children, why he or she wants to be a Scout leader, and what discipline techniques he or she would use. ■Two-deep leadership. Two registered adult leaders or one registered leader and a parent of a participant, one of whom must be 21 years of age or older, are required on all trips and outings. The chartered organization is responsible for ensuring that sufficient leadership is provided for all activities. ■No one-on-one contact. One-on-one contact between adults and youth members is not permitted. In situations that require personal conferences, such as a Scoutmaster's conference, the meeting is to be conducted in view of other adults and youths. ■Respect of privacy. Adult leaders must respect the privacy of youth members in situations such as changing clothes and taking showers at camp, and intrude only to the extent that health and safety require. Adults must protect their own privacy in similar situations. ■Separate accommodations. When camping, no youth is permitted to sleep in the tent of an adult. Councils are strongly encouraged to have separate shower and latrine facilities for females. When separate facilities are not available, separate times for male and female will be scheduled and posted for showers. ■Proper preparation for high-adventure activities. Activities with elements of risk should never be undertaken without proper preparation, equipment, clothing, supervision, and safety measures. ■No secret organizations. The Boy Scouts of America does not recognize any secret organizations as part of its program. All aspects of the Scouting program are open to observation by parents and leaders. ■Appropriate attire. Proper clothing for activities is required. For example, skinny-dipping is not appropriate as part of Scouting. ■Constructive discipline. Discipline used in Scouting should be constructive and reflect Scouting's values. Corporal punishment is never permitted. ■Hazing prohibited. Physical hazing and initiations are prohibited and may not be included as part of any Scouting activity. ■Junior leader training and supervision. Adult leaders must monitor and guide the leadership techniques used by junior leaders and ensure that BSA policies are followed. Parents participate in the protection of their children in a variety of ways. We have already mentioned the need for open lines of communication so that children are encouraged to bring any troubles to their parents for advice and counsel. In addition, parents need to be involved in their sons' Scouting activities. All parents receive important information concerning the Scouting program as part of their sons' membership applications. This information is provided so that parents can detect any deviations from the BSA's approved program. If any deviations are noted, parents should call these to the attention of the chartered organization or the unit committee. If the problems persist, parents should contact the local council for assistance. What is Order of the Arrow? Philmont? SeaBase? Some of you may hear some of these names used, but not know what they are. ■Order of the Arrow: The National Honor Society of the BSA! Scouts who best exemplify the Scout Oath and the Scout Law are elected by the youth members of the troop to the OA. The Order of the Arrow provides opportunities for service, brotherhood, and leadership beyond the troop level. Members of the OA are known as Arrowmen. There are three levels of membership, Ordeal members, Brotherhood members, and Vigil Members. ■Philmont: Philmont is the oldest Boy Scout high adventure base in the country, and is almost mystical and legendary in its appeal. Our Troop typically sends a crew to Philmont every two to three years for a 10-day, 60-80 mile backpacking experience. In addition, the Potawatomi Council sends contingents that members of Troop 71 are eligible to join. ■Florida SeaBase: SeaBase is also a Boy Scout high adventure base, and in this instance the attendees will spend nearly two weeks sailing or scuba diving in the Florida Keys. ■Northern Tier High Adventure Base: Northern Tier is a Boy Scout High Adventure Base which is focused on canoeing in the Boundary Waters area of Minnesota and Canada. ■Scouts need to be at least 14 years old the year they attend any high adventure camp. How does my son advance in the ranks? Scoutmaster, Assistant Scoutmaster, Junior Assistant Scoutmaster, Senior Patrol Leader, Assistant Senior Patrol Leader, Troop Guide (who must be Star rank or above). Rank advancements cannot be signed off by a family member. However, if the family member provides verifications that a requirement was satisfactorily completed, then one of the above may sign off the requirement. All ranks require a Scoutmaster’s Conference prior to the Board of Review. Conferences can be requested at any time with the Scoutmaster or an Assistant Scoutmaster as long as it does not interfere with the running the weekly meeting. Scouts must be in full Class A uniform and have their Scout Handbook and merit badge blue cards or the conference will be postponed. The uniform requirement is waived for the Scout rank. Scouts must appear before a Board of Review as a final step for rank advancement. Scouts must be in full Class A and have their Scout Handbook and merit badge blue cards - no uniform or no handbook - no advancement! No Board of Review is required for the rank of Scout. Rank advancement is recognized at a formal ceremony called a Court of Honor. It is meant to be a solemn occasion focusing on each Scout’s growth and achievements. All Scouts are expected to wear their full Class A uniforms, including merit badge sashes. Parents/guardians are expected to attend each Court of Honor and will be asked to join their son in front of the Troop when he receives his patch and recognition for rank advancement. How does my son earn merit badges? Merit badges are required for rank advancement from First Class to Eagle. There are over 100 merit badges in the Scouting program and they offer Scouts an opportunity to explore areas in which they may not have engaged otherwise. A list of merit badges can be found in the Scout Handbook. There are merit badges for many areas of interest, such as sports, hobbies, careers and Scouting skills. Through merit badges a Scout learns to manage himself, his home, his health and others. Prior to working on a merit badge and before meeting with a merit badge Counselor, it is the Scout’s responsibility to obtain a Blue Card (Application for Merit Badge) from the Scoutmaster or the Assistant Scoutmaster - Advancement. The Blue Card is the permanent record of the Scout’s completion of the merit badge. It has three (3) sections: the Scout, the Merit Badge Counselor, and the Advancement Committee each keep a portion of the card. The Scout should fill out the information on the front of the Blue Card (print in ink) and then have the Scoutmaster sign it. Once the Blue card has properly filled out and signed by the Scoutmaster, the Scout should contact the appropriate merit badge Counselor to discuss the requirements and see if there are any special instructions. If the Troop does not have a Counselor for that badge desired, then the Scout should contact someone on the merit badge Counselor List for the Potawatomi Council’s Southern Trails District (the Advancement Chairperson should have the most recent copy). Scouts must use the "buddy system" for working on merit badges and meeting with merit badge Counselors outside of Scout meetings. It is more fun to work with someone else and it is in the best interest of the Scout and the merit badge Counselor that a Scout and an adult not meet alone without the parent’s/guardian’s consent. Once a Scout thinks he has completed the requirements for a badge, he is to contact the merit badge Counselor and arrange a time to discuss how he has met each requirement. The Counselor will review the quality and thoroughness of the work of each applicant and the decision whether to approve completion of the merit badge rests completely with the merit badge Counselor. The Counselor will sign the Blue Card when he/she is satisfied that the Scout has completed the merit badge. The merit badge Counselor will keep the appropriate portion of the Blue Card for his/her records. The completed Blue Card should be presented by the Scout to the Advancement Chairperson and the merit badge will be presented at the next Court of Honor. After receiving merit badges at a Court of Honor, save all blue cards and cards attached to the merit badges. They are important documentation of when merit badges were earned that will be needed to go with the application for Eagle Scout. Plastic sheets for baseball card collections are excellent for storing Blue Cards. Special note on earning merit badges: It is the Scout’s responsibility to follow the requirements of each merit badge exactly. If a merit badge requirement states that a Scout must "show or demonstrate" a skill, the Scout must actually exhibit the skill to the Counselor; talking about a skill is not sufficient. Scouts are advised to read each requirement carefully and follow it to the letter. The buzzwords, terminology, and acronyms sprinkled throughout this paper and at meetings is very confusing. Can you explain some common terms? A special meeting held in August. The Senior Patrol Leader holds a brain storming session with all members of the troop trying to create a list of program themes and outings that the scouts are interested in. Patrols then hold meetings where each Patrol Leader is expected to come up with his patrol's favorite ideas. Finally, after the rest of the troop has gone home, the Patrol Leaders’ Council holds a meeting to assign program themes to each month of the coming year and to pick tentative dates for the popular activities. The Annual Planning Conference gives every boy in the troop a voice in our program! One of over 200 organizations world-wide which comprise the Scouting movement! The BSA, along with the Girl Scouts of the USA, exists as a service to youth in the United States. The BSA, along with similar national organizations from around the world, is a member of the World Scouting Movement. Troop 71 is, of course, a member unit of the BSA. Commissioner, Unit Commissioner, District Commissioner, etc. Adult volunteers who coordinate activities beyond the scope of a single unit, at the district level and above. Commissioners help create new units, they run the Roundtables, they serve as communication links between individual units and the rest of Scouting. "Service to the Units" is their mission in life. A sub-division of the Boy Scouts, which is comprised of several hundred councils - each chartered to provide service to Scouting units in a relatively small geographic area. Troop 71 is located in the Potawatomi Area Council, which includes all of Waukesha County and portions of southern Washington County and eastern Jefferson County. Our Scouting neighbors to the east are served by the Milwaukee County Council. The main office of a council is usually called a "Service Center". Councils are sub-divided into smaller “districts,” which provide service to just a few communities. We are part of the Southern Trails District. A special troop meeting, held three or four times a year, to honor members of the troop for their accomplishments. These meetings are held in the Presentation Hall in the basement of the Parish Center. In Troop 71, rank advancement, (up to Eagle), is always presented immediately. At the COH, members are presented the signed card - (rank advancement patches will have been presented already). Merit Badges and special awards are all presented at the COH. In addition, special Courts of Honor are scheduled to honor those individual Scouts who have attained the rank of Eagle. The highest rank in the Boy Scouts of America. Scouting Organizations in other nations generally have an equivalent, (ie. Queen's Scout in England). Eagle Scouts have completed at least 21 merit badges, they must have served several terms as troop officers, they must demonstrate that they live by the Scout Oath and Scout Law, and they must plan and provide leadership to complete an extensive service project - their Eagle Project. Only a very few Scouts ever make it to Eagle. 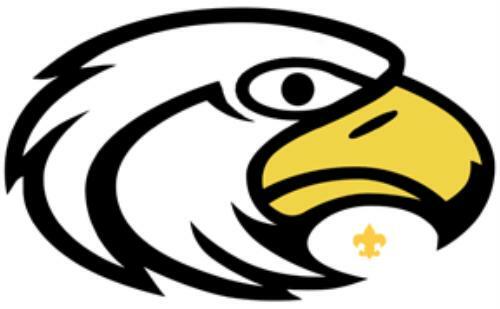 Eagle Scouts are encouraged to join the National Eagle Scout Association. Troop 71 has "hatched" many Eagle Scouts. Junior Leader Training is the primary responsibility of the Scoutmaster and his assistants. In Troop 71, the acronym JLT often refers to a weekend campout training session called Pine Tree for members who are planning to serve as officers of the troop. More generally, JLT includes interviews, goal setting, and mentoring that goes on between Scoutmasters and junior officers throughout the year. Junior Leader Training Camp, (JLTC), refers to a week long training session offered at the Council level. Governing body of a Scout troop in the BSA. In Troop 71 the Senior Patrol Leader acts as chairman - he and the Patrol Leaders each have a vote. Other non-voting junior leaders may be included as needed. These are all youth members of the troop - this is the heart and soul of a boy-run program. The Scoutmaster acts as advisor to the PLC. He offers advice and acquires resources as needed. The Troop Committee has oversight powers over the PLC and the Scoutmaster. Not like military rank, Scout Ranks are not related to "Chain-of-Command" or positions of authority. In Scouting, "Ranks" are earned by learning and demonstrating skills. A new Scout in the BSA would quickly qualify for his basic "Scout" rank. "Tenderfoot," "Second Class," and "First Class" will be earned by an active Scout within his first year in a strong troop. Ranks above this are "Star," "Life," and Eagle Scout. These later ranks all require public service and leadership experience! Boy Scouts, (in the BSA), are ineligible for rank advancement after their 18th birthday. Roundtable is a monthly meeting of all adult leaders from a single district. It's purpose is to provide ongoing training, and to communicate information from all levels of the BSA down to adult leaders in individual Scout units. In our district, separate sessions are held for Boy Scout troops and Cub Scout packs. The Southern Trails Roundtable is held on the first Wednesday of each month at different locations in the district. Adult Leaders who get really involved in the program are often referred to as Scouters. This differentiates them from youth members who are Scouts. If you get to the point where you are spending as much time working with Scouts as most people spend on their careers, then you are a Scouter! The Troop Committee has a responsibility to support a boy-run program. The Troop Committee also handles finances, transportation, and any aspect of troop operation beyond the means of youth members. The Troop Committee Chair runs the show. The Committee Chair is supported by numerous other Committee Members with specific responsibilities. All parents in the troop are welcome to attend meetings and contribute. Scouting has always been a "uniformed" activity. Uniforms help to instill pride and unity. Class distinctions disappear and members are constantly reminded of the high standards of Scouting when in uniform. By tradition, the official shirt, belt, pants, socks, and hat represent the full uniform, often referred to as "Class A" uniforms... from military usage. This is actually more correctly called "the field uniform." Scouting is NOT a military organization, but tradition is hard to argue with. "Class B" refers to a Scouting T-shirt, often worn during casual events or work details. We accept a plain shirt (with no lettering or logos) as a Class B shirt. Troop 71 defines the Class A uniform as an official shirt, worn with any clean pair of jeans, slacks or shorts (with belt loops), but our leadership certainly encourages full uniform when possible! Just to be clear, a Court of Honor, a Flag Ceremony or most meals at summer camp are "Class A" events. Venturing Crews, which are separate units of boys and girls between the ages of 14 and 21, used to be called Explorer Posts, however the Exploring program has now been spun off and is not directly associated with Boy Scouts, (Venturing Crew members may continue to work towards Boy Scout rank advancement, Explorers cannot). Venturing Crew 71 is associated with our Troop. Most of the members of Troop 71 started their Scouting careers as Cub Scouts. Boys between the ages of 6 and 11 are organized into "dens" of Tiger Cubs (first grade), Wolf Cubs (second grade) and Bear Cubs (third grade). Fourth and Fifth grade Cub Scouts are called "Webelos" - it stands for "We'll be loyal Scouts!" Webelos activities are all geared toward preparing a young man to "bridge" over into a Boy Scout Troop. Troop 71 activities and meetings are almost always open to any Webelos Den or family that would like to visit us. Advanced training for Scouters. The course was originally written and designed by the founder of Scouting, Lord Robert Baden-Powell, as a way to improve the leadership and program skills of Scoutmasters. In the United States, the course has continued to evolve and is applicable to adult leaders serving in any capacity. "Wood Badge" refers to the wooden beads that course graduates are entitled to wear with their uniforms, copies of South African native beads which General Baden-Powell had captured during one of his military campaigns. See www.woodbadge.org. The United Nations of Scouting, made up of national Scouting organizations from around the world. The BSA is a member of the World Organization of Scouting Movements. WOSM is responsible for, among other things, organizing World Jamborees. The official web site is www. scout.org.